This web page took six to seven hours of research and design for your enjoyment. Thank you for supporting the Virtual Steam Car Museum! This was a typical tiller-steered steam buggy, powered by a 7 to 9 hp 2-cylinder vertical engine, having a single chain drive. A dos-a-dos four-passenger body was available in addition to the two-passenger. The Steamobile had a curved dash like that of the Oldsmobile, although it was higher-built. 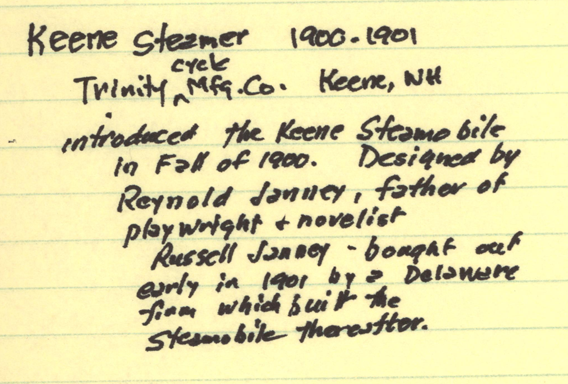 John Conde believes the Keene Steamer was "introduced in the fall of 1900" by the Trinity Cycle Manufacturing Company of Keene, NH. It was "designed by Reynold Janney, father of playwright & novelist Russel Janney. The firm was bought out early in 1901 by a Delaware firm, which built the Steamobile thereafter." Conde cites no source. The corporate history of the Keen Steam Car remains to be written. It may have been known as the Keen Automobile Company or the Trinity Cycle Manufacturing Company as well as the Steamobile Company of America. 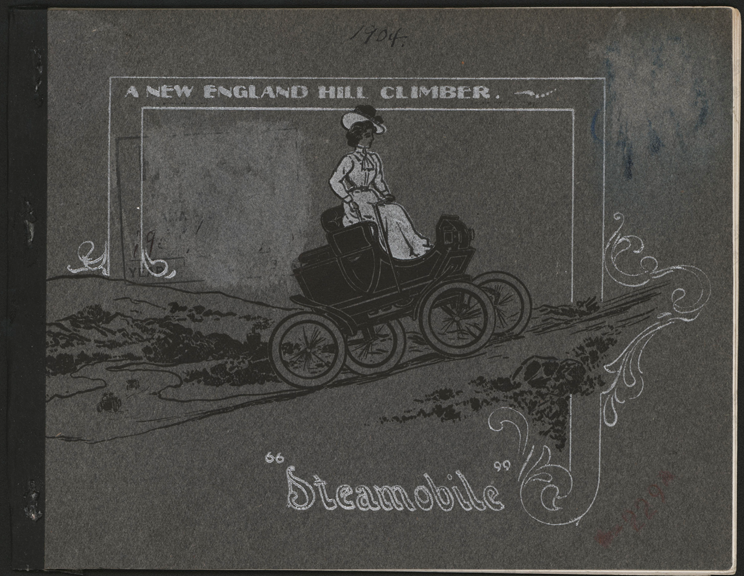 This flyer came bound in the Steamobile Company trade catalogue entitled "Twixt You And Me." [See Below.] 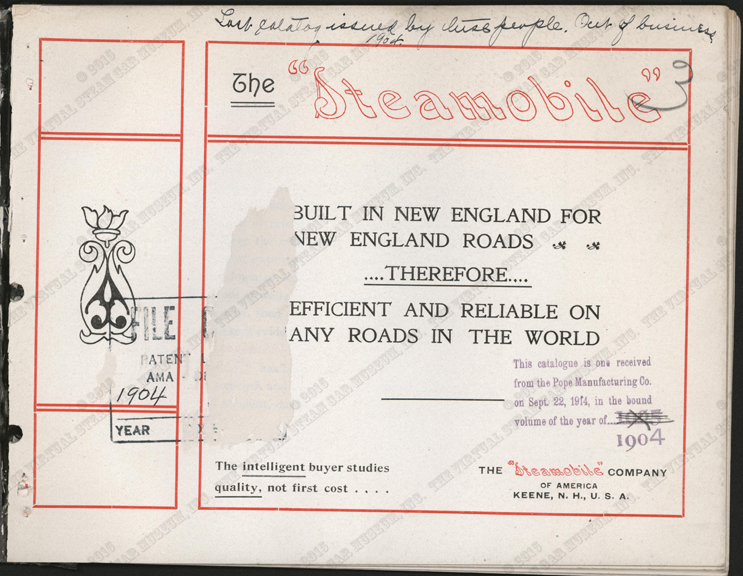 It references the Keen Steamobile Company and carries a file stamp from the Pope Manufacturing Company. John A. Conde Collection. 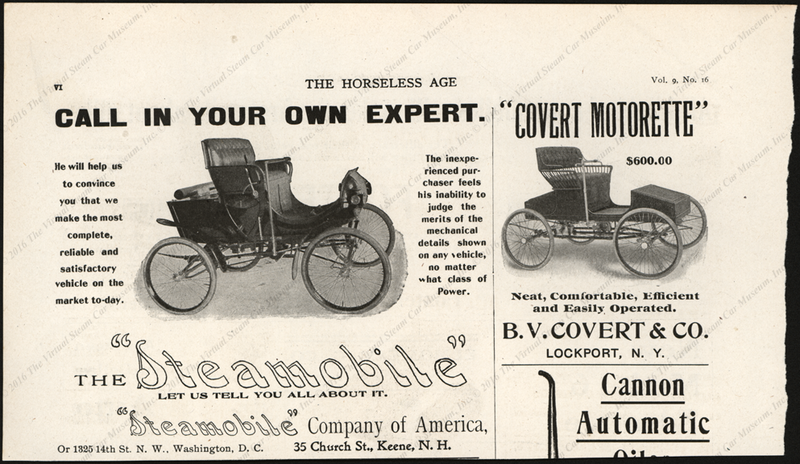 This Steamobile magazine advertisement appeared in Horseless Age on April 16, 1902, Vol. 9,No. 16, page V. On the reverse is a Foster Automobile Manufacutring Company advertisment and immdeiage below is a Kensington Steam Car advertisement. 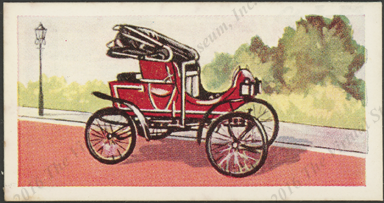 This 1900 Steamobile trade catalogue also carries the remains of an AMA file stamp on the front cover, and something has been torn from the front cover. It has had a hard life that includes hole punching and binding at the Pope Manufacturing Company , then unbinding at the Stevens Institute of Technology, a subsequent reassembly repair with black tape along the spine, at which time the restaurant flyer was inserted, and finally partial disassembly by the VSCM for scanning. It is in need of conservation. 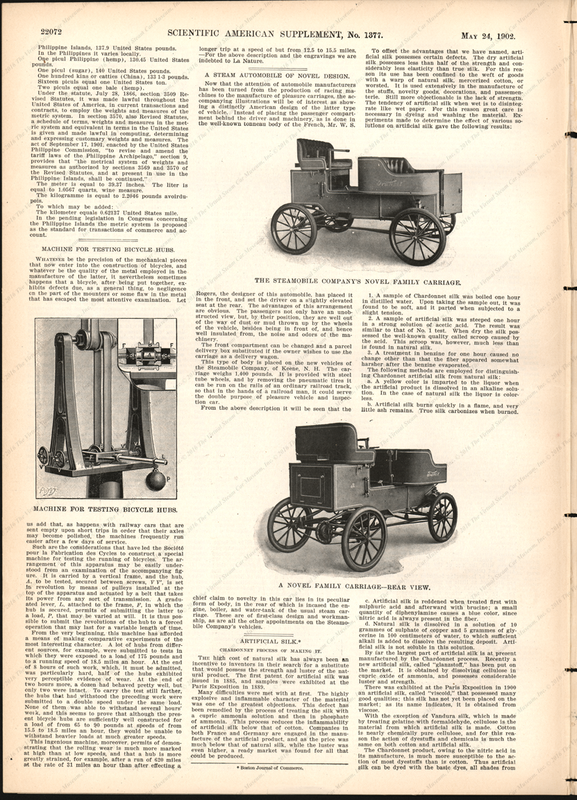 On May 24, 1902, the Scieitific American Supplement carried this article on the new Steamobile body design, its Family Carriage. 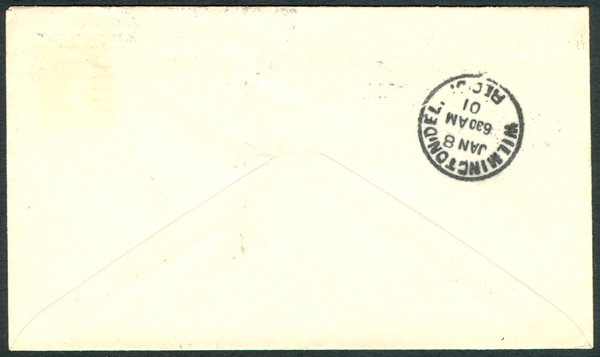 This postal cover carries the Steamobile's return address in New York City, almost certainly its sales office. 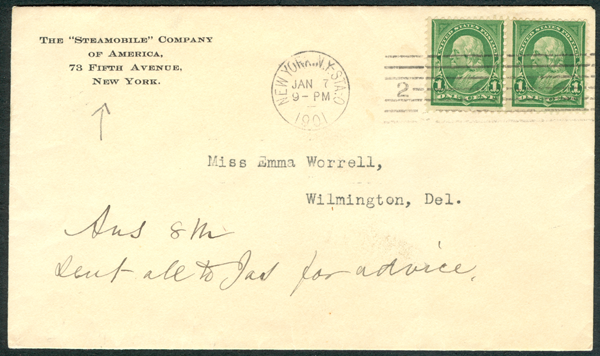 It was mailed on January 7, 1901 to a Miss Emma Worrell in Wilmington, DE. She apparently "sent all" it to Ja[me]s for advice. Was she seeking advice on purchaseing a vehicle or investing in the company? What else did she send? 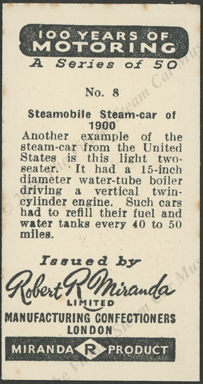 The Steamobile steam car was featured as number 8 in a series of 50 cards celebrating 100 Years of Motoring produced by Robert R. Miranda, LTD, the self-described Manufacturing Confectioners of London. Georgano, G. N., Encyclopedia of American Automobile, (New York, E. P. Dutton & Co., 1968), p. 187. 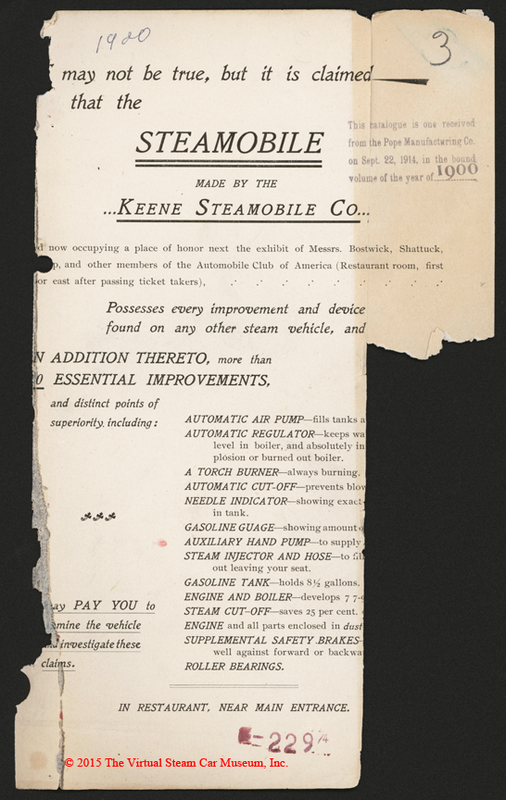 Contact us if you have additional information about the Steamobile Company of America or the Keene Steam car, or if you have questions.